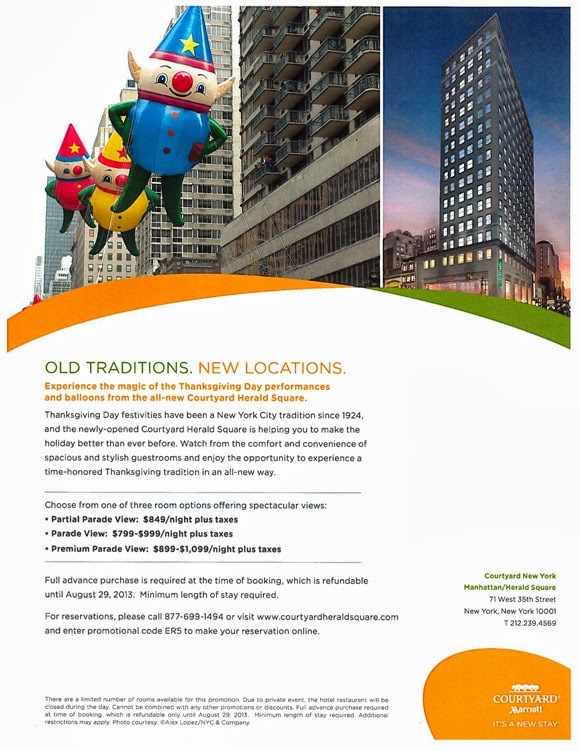 We took a tour of the Courtyard Marriott Herald Square a few weeks ago, and checked out the incredible views some of their rooms have for Macy's Thanksgiving Day Parade. Sick, I'm telling you. 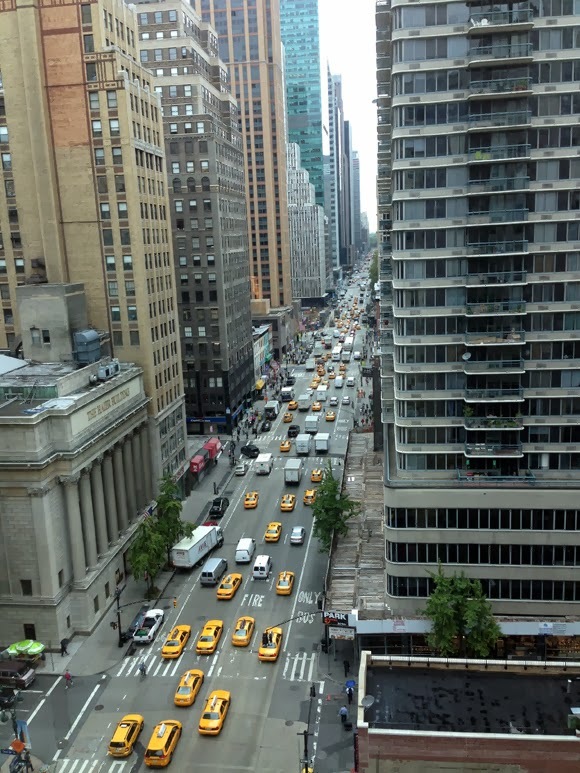 Let's review: above is a shot from one of Courtyard Herald Square's amazing, premium parade-view rooms. This view is from the room's window looking up Sixth Avenue. THE PARADE GOES DOWN SIXTH AVENUE. It then turns right onto 34th Street, and you'll have that view, too. Essentially, you will see the parade coming and going. This will be as close as you can get to having the parade march right through your hotel room. 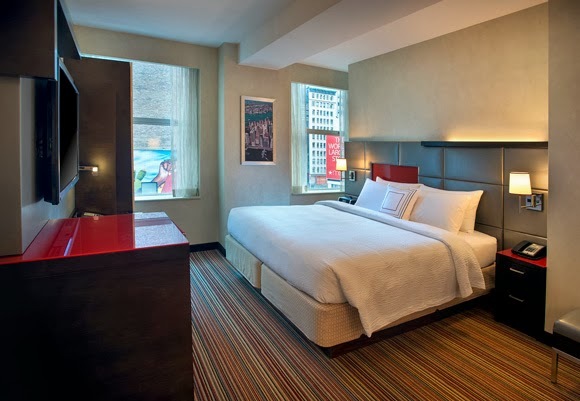 Courtyard Herald Square has select rooms with full and partial views of the parade. I think it's worth every penny for this once-in-a-lifetime experience (click to see room options and pricing, left). Couples, families, romance, or pure fun, this is an opportunity to make some seriously special memories. 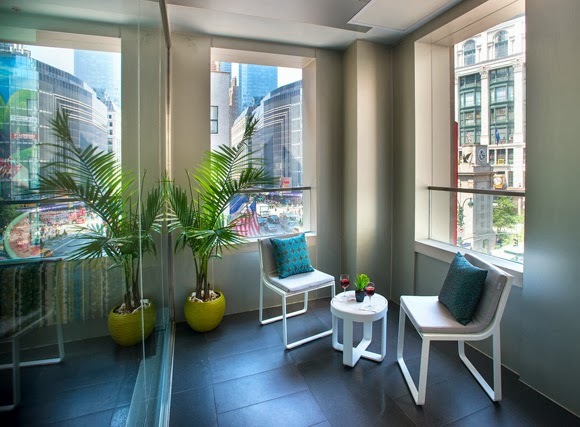 Also, available to rent is the hotel's lovely lobby deck, which is cleverly designed as an outdoor space overlooking Herald Square, great for bigger parties. If it's a chilly day, there are tables just inside next to the deck. The rooms? A photo is below; as you can see they are pretty, modern, and quite spacious. The bathrooms, too, are generous in size. There are also closets where you can stash all your Black Friday loot. Clearly, you can't come for the parade without staying to shop Black Friday on 34th Street. You'll be steps away from all the major stores! Then, at the end of the day, you can kick back with a drink at the Monarch Rooftop Lounge on the hotel's 18th floor. If you're a guest of the hotel you won't have to wait in line to hang out at this very trendy spot. I totally just sold myself. I'm starting to save up for next year right now, no joke. Photos below are courtesy of Courtyard Herald Square. I believe this is a partial-view room. 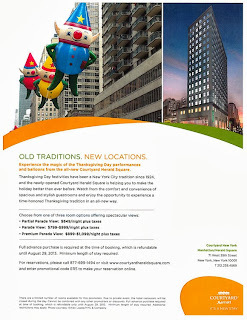 You'll be able to see the parade at Sixth and 34th Street. The very lovely lobby deck, available for rent. Again, great parade views.